Many women report that during menopause, they often experience severe and violent mood swings. Fortunately, there are plenty of treatments available. What Are the Signs and Symptoms of Severe and Violent Mood Swings? There are many causes for mood swings, but among menopausal women, the primary cause is a hormonal imbalance. The hormones estrogen and progesterone are important in the production of the neurotransmitter in serotonin (a chemical that helps regulate mood). During menopause, imbalanced levels of estrogen and progesterone cause serotonin levels to fluctuate, which can cause sudden and drastic mood changes. This effect can be amplified if there is a large amount of stress in your life, for example from careers, children, or elderly parents. How Can I Manage My Severe and Violent Mood Swings? Eating healthy. Getting all the essential vitamins and nutrients that your body needs is critical to maintaining stable hormone production. Remember to eat lots of fruits and veggies, complex carbohydrates and omega-3 fatty acids. Exercising. Maintaing a healthy body is one of the best ways to stabilize and balance the body's hormone levels. Try exercisiong between 2.5-5 hours a week. De-stressing. Life is stressful, and things happen. This stress can destabilize your hormones, and especially during menopause, cause more anxiety than you might usually experience. Try and do some relaxing things to try and stabilize your body. For example, soaking in warm baths, meditation, walking outside, or yoga are all good ways to relax. If you are concerned about your mood swings, consult a doctor. Mood swings are a symptom of a variety of other problems, and may indicate a different type of chemical imbalance in your body. 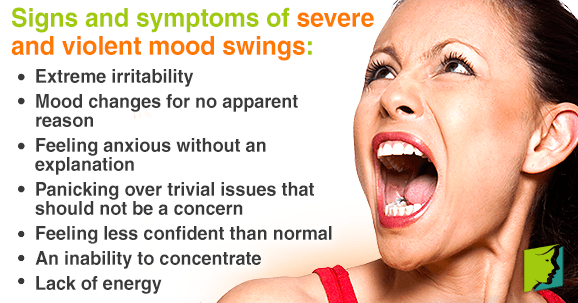 Click on the following link for more information on treating mood swings.